LAST year they were celebrating Valentine's Day under the stars with a romantic message scrawled in the sand. But this year young Bundaberg lovers Chevy Datlen and Amy Page have a different reason to celebrate after the birth of their first son late last year. 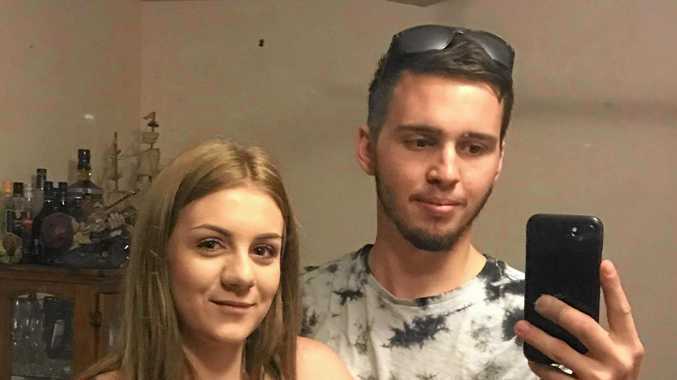 Mr Datlen made a public declaration of love last year, writing "Happy Valentine's Day Amy” in the sand at Bargara Beach, later telling the NewsMail it wasn't pre-planned. "It was a spur of the moment thought, something nice, romantic, down the beach, in the moonlight,” he said. "She loved it when she saw it. This year Mr Datlen said the lovestruck couple's Valentine's Day would involve flowers, dinner and a movie. "Valentine's Day this year with my gorgeous girl will consist of a nice fresh bunch of roses after I finish work, followed by a nice dinner at a place of her choice and the movies after,” he said. 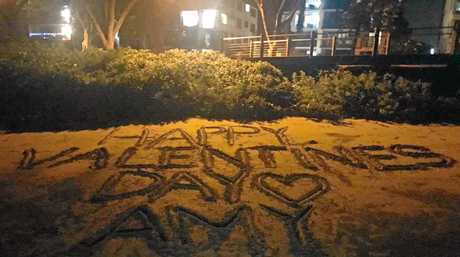 Chevy Dalten's Valentine's Day message to his girlfriend Amy along Bargara Beach.